Amount of distance which a predefined region of the heart moves during a predefined time interval. Typically, the displacement of the annular plane (either the mitral or the tricuspid) during systole in the longitudinal direction (towards the transducer). Value is expressed in mm or cm. The (maximum) speed of a predefined region of the heart. 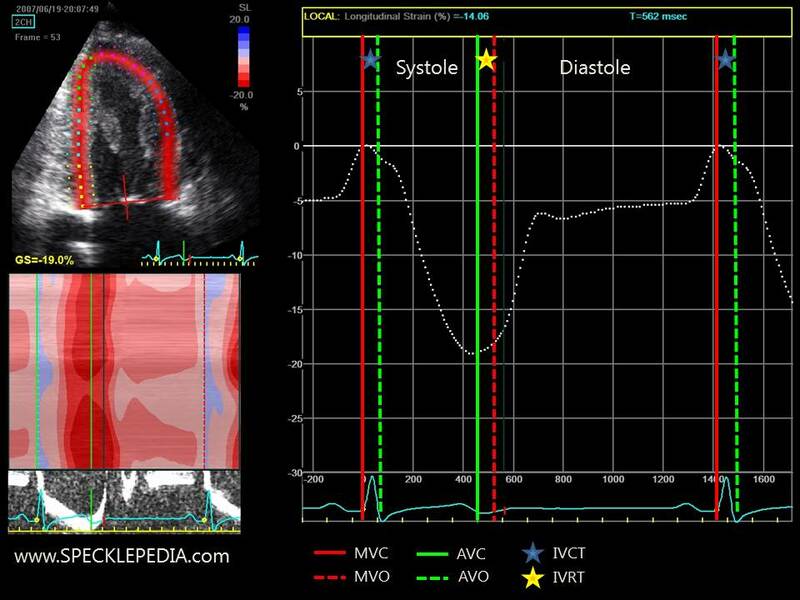 Typically, the maximal speed is measured at the annular plane (either the mitral or the tricuspid) in the longitudinal direction (towards the transducer). The maximal velocity during systole is termed S`. 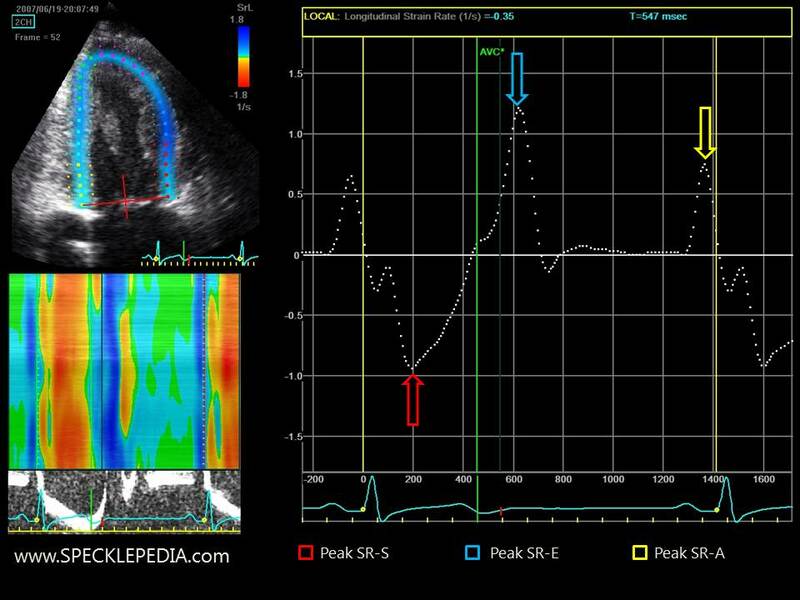 During diastole, both the early relaxation (E`) and late atrial contraction (A`) peak velocities can be measured. Value is expressed in cm/sec. The amount of deformation of a predefined region of the myocardium in respect to its original length. The original length is not measured, but expressed as the 0% point, typically set at the onset of the QRS complex, when ventricular contraction starts. The amount of deformation is expressed as %. During systole, the myocardium deforms due to myocardial cell shortening. This deformation reaches its peak at the time of the aortic valve closure of shortly afterwards. In the longitudinal and the circumferential direction, the myocardium shortens, thus is represented by a negative percentage value. In the radial (or transverse) direction, the myocardium “thickens” and is therefore expressed by a positive percentage value. During diastole, the myocardium deforms back to its original length/thickness and should have a value of 0% at the beginning of the next cardiac cycle. Deformation can be measured/derived form a pre-specified region of interest (typically a segment according to the ASE/EAE). This calculates regional strain. When the average of all segments is used, the global strain is measured. Typically, the global longitudinal strain (GLS) of the left ventricle is measured. During the cardiac cycle, different “events” on the strain graph can be identified and are shown in the figure. 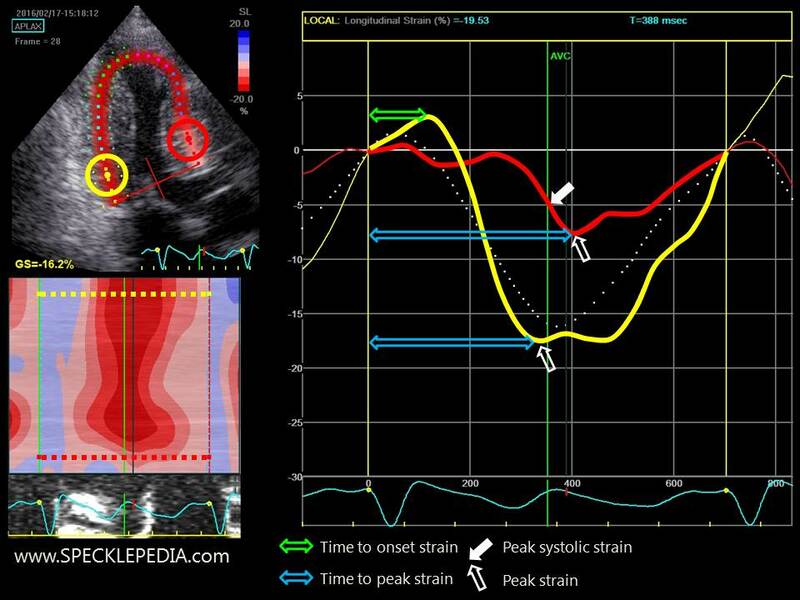 Time to peak strain: Defined as the time in msec from the onset of the QRS complex on the ECG to the peak strain value. Strain-rate is the first derivative of strain and indicates the speed at which deformation is occurring. When there is longitudinal shortening (during diastole), the strain- rate is negative, when there is longitudinal lengthening / elongation (during both the early and late filling phase during diastole), the strain-rate is positive. When there is no deformation occurring, the strain-rate value is zero. The steepness of the strain curve indicates the speed at which deformation is occurring, the faster this is taking place, the higher (or lower) the strain-rate value is. This is further explained in figure. 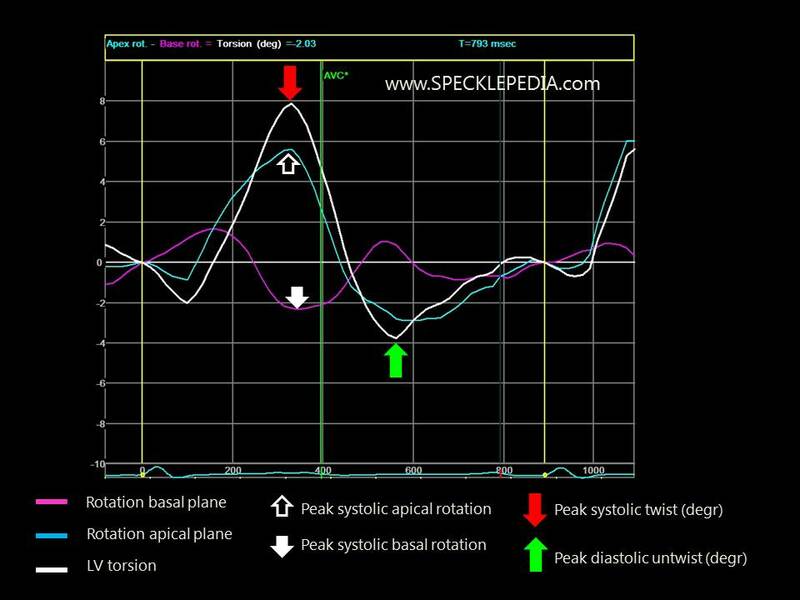 Peak systolic strain rate, or SR-S. The maximal value (negative for longitudinal and circumferential SR and positive for radial/transverse SR) between the onset of the QRS complex and the AVC. This parameter has been found to correlate to regional myocardial function and is less influenced by loading conditions (in other words, it might reflect contractility better than strain values). 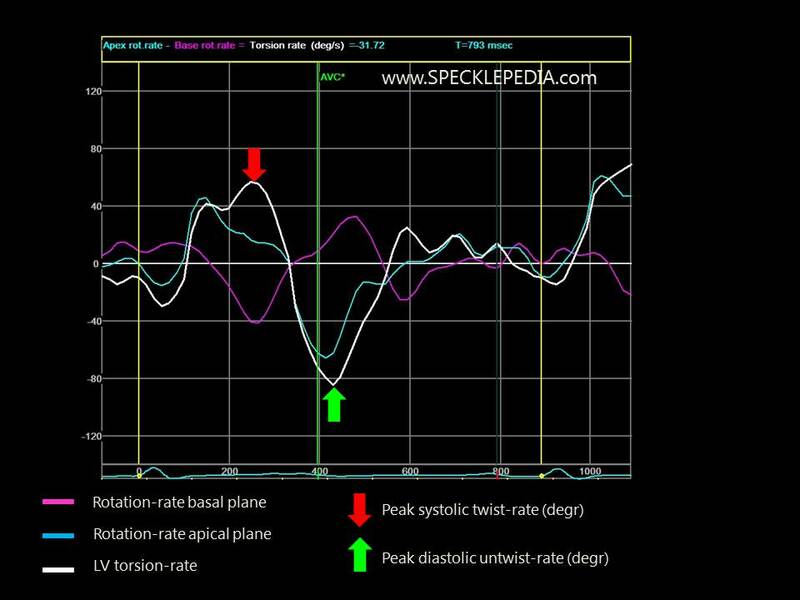 Peak early (active) diastolic strain rate, or SR-E: The maximal value after the AVC and before the P-wave on the ECG. Often, multiple peaks can be identified due to the complex relaxation sequence of the LV.